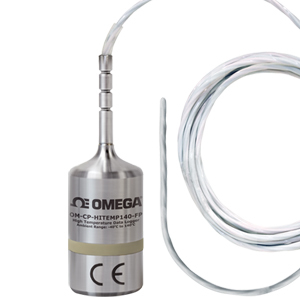 The OM-CP-HITEMP140-FP is a durable, user friendly high temperature data logger featuring a long, flexible RTD probe with a narrow diameter, making it ideal for use in steam sterilization and lyophilization processes. Commonly used for mapping, validation and monitoring of high temperature surfaces and environments, this stainless steel data logger is available in two models, the OM-CP-HITEMP140-FP-36 and the OM-CP-HITEMP140-FP-72, which feature either a 91.4 cm (36") or 183 cm (72") flexible probe length. The flexible probe is coated with PFA insulation and can withstand temperatures up to 260°C (500°F) with an accuracy of ±0.1°C (±0.18°F). The OM-CP-HITEMP140-FP is also available with an optional thermal shield enclosure to extend the operating range of the data logger to -200 to 250°C (-328 to 482°F). The OM-CP-HITEMP140-FP-TSK (Thermal Shield Kit) comes with either a vented or flush top enclosure to accommodate a multitude of applications. The OM-CP-HITEMP140-FP probe design is narrow and lightweight making it ideal for placement within small vials, tubing, test tube and other small diameter or delicate applications. Because of the flexible probe, the risks of breakage (both vial and probe) generally associated with stainless steel probe data loggers are diminished and the location and placement of the probe is easy to manipulate. The device records and stores up to 32,700 time stamped readings and is equipped with non-volatile solid state memory which retains data even if the battery becomes discharged. The OM-CP-HITEMP140-FP utilizes the latest software. Data can be viewed in graphical or tabular formats and summary and statistics views are available for further analysis. The software features export to Excel®, data annotation, digital calibration and more. Trigger Settings: High and low limits may be set. Once data meets or exceed sets limits, the device will record to memory. Bi-level start and stop triggers can also be programmed. Users can specify the number of readings to take after the device triggers.